Games can liven up a bonfire party! Include some creative outdoor bonfire party games at your next get-together and make the night an unforgettable experience. A bonfire is a great way to get together with a group of friends or family. A bonfire party can be fun for people of all ages. At the bonfire party, food is a necessity. Be sure to include foods to make over the fire such as roasting marshmallows to make s'mores and roasting hot dogs on sticks. Both of these food choices are not only tasty but are fun to make. 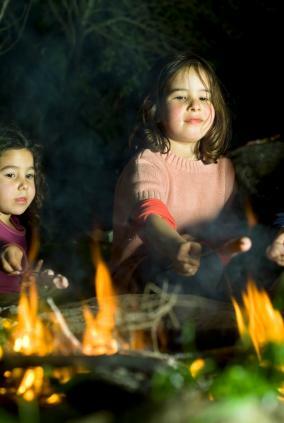 Another activity that is fun to do around a bonfire is to tell stories. Whether they are ghost stories or personal tales, story time is a great way to bond over the fire. Of course, when attending a bonfire party, your guests will want to have a ton of fun. Include some outdoor bonfire party games to liven up the day. There are many possibilities when it comes to games. Take into consideration the ages of your guests and how much room you will have to play the games. Play the alphabet game. Go through the alphabet and pick a subject such as animals. Everyone takes a turn and has to name a specific animal starting with the particular letter of the alphabet that you are on. Animals are just one possibility to try. Be creative and come up with unique subjects. It can get hot around a bonfire. Include some games involving water. Water balloon toss is a fun way to keep cool around the fire. You can also play games such as giving each person an ice cube and whoever can keep the ice cube in his or her hand the longest is the winner. Alternately, see who can melt the ice first. Since you will most likely have food at the party, make a game out of it. Have a s'mores making contest. Guest at a bonfire party always throw things into the fire. You can make a game out of this as well. Set a timer and ask guests to gather branches and leaves. Each person then takes a turn throwing one thing into the fire. Whoever is left with something at the end is the winner. Play Truth or Dare around the fire. Just be careful and make sure that this game remains light and fun. Sometimes it can get out of control and make people feel uncomfortable. Have a sing-along. Start with one person singing a line of a song and continue on to the next person. See how long this can continue and if you can actually finish an entire song. Trivia games are great to play. You can ask questions on any subject and see who knows the answer. Bonfires can be a lot of fun but they can also be dangerous. Keep your guests' safety a top priority and make sure everyone is acting responsibly and is aware of the fire's dangers. At the end of your party, always make sure that you extinguish the fire completely before leaving the area. A bonfire party is the perfect opportunity to spend time with friends. Whether it is talking or playing games around the fire, this type of party is fun for people of all ages. Make safety a priority at all times and make sure that your guests have a great time. Your night is sure to be memorable for all attending! .